This very peated Single Malt is a 2008 vintage, aged 8 years in American Bourbon and Tennessee whiskey casks. It's a unique limited edition. With this new limited edition, Octomore offers a Single Malt distilled in 2008 from 100% Scottish barley. The whisky benefited from an aging of 8 years in barrels of Bourbon and Tennessee whiskey. These casks contained Buffalo Trace, Clermont Springs, Four Roses, Heaven Hill and Jack Daniels whiskey. Made from 100% Scottish barley and Islay spring water (an island part of the Hebrides archipelago). This whisky is one of the most peated in the world (167ppm*) and was distilled in 2008 with barley harvested in 2007. Octomore Edition 8.1 did not undergo any cold filtration or staining. This edition was bottled at Bruichladdich distillery, by Adam Hanett (Master Distiller). 42,000 bottles of this new expression are available worldwide. 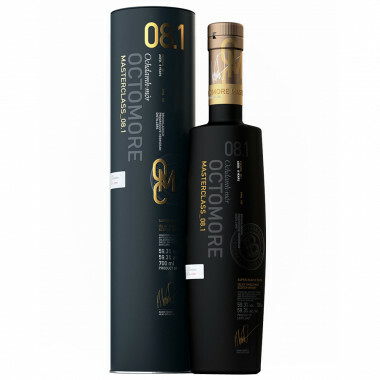 Each Octomore edition is a huge hit and is awaited by Single Malt fans all over the world! Nose: smoky, with powerful aromas of peat. Notes of candied oranges, pepper and chocolate. Palate: sweet and delicate, it has a superb combination with notes of fruits and smoky touches. We find the oak with notes of vanilla, marzipan and citrus for a powerful and perfect balance. Finish: dry peat, iodine and oak. Notes of mint and blueberry come to marry with the persistent smoke of peat.